Tis’ the season for corporate gift giving! However, that doesn’t mean it’s Jolly Good Fun trying to pick out the perfect gift for the executive or employee who has everything. Frankly it can be brutal. We feel your pain! AND… We have your back! Shop this unique online holiday gift catalog for personalized gifts that won’t be re-gifted to someone else at next year’s company holiday party. Click on the catalog below to get started! It’s true that the gifts you give to employees, customers and friends can make a big difference in the business world, so you don’t want to settle for something sub-par right at the last minute. Let us guide you through this holiday season by helping you choose from an array of professional, upscale gifts that make a fantastic impression from the boardroom to the water cooler. 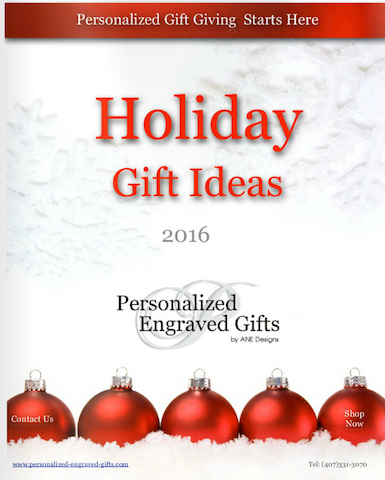 Besides the great holiday catalog mentioned earlier, here are some additional great ideas for the 2016 holiday season. 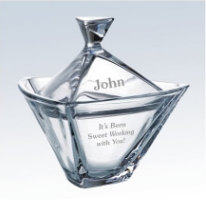 An appropriate and impressive gift ideal for corporate gift giving is the crystal triangle candy dish with lid. Crafted from crystal, these uniquely shaped containers eye-catchingly stand out, making them a great addition to any desk in the workspace or the home. The candy dishes are equipped with a small lid, which adds to its luxurious appearance. The glass lid and dish can be engraved with two lines of text or even a logo, making it a breeze to personalize. For an extra touch that speaks volumes, fill the candy dish with the recipient’s favorite snacks or sweets, and prepare for sincere appreciation and thanks for the thoughtful gift. There is perhaps no item more appropriate for the corporate environment than a crystal water set. Even if the recipient isn’t a water drinker, they can utilize the set for tea, juice or any one of countless liquids. 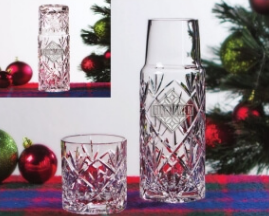 While they pour from the carafe and sip from the glass, they will be promoting your business, if the crystal water set is branded and personalized. The crystal water sets have a high-quality design that is meant to stand out amongst a sea of more traditionally-shaped and generic carafe and glass sets. 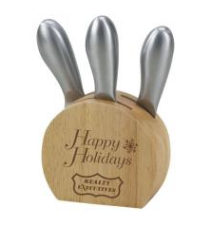 Another ideal corporate gift is a stainless steel cheese tool set. A perfect accessory for cutting and serving cheese, this set adds class to any kitchen. The thick wooden block holding the tool set can be engraved with your company logo, making it a unique and fun gift anyone would be proud to display in their home. The holidays are a time to be merry and bright and nothing brings that out more than wine. Help your gift recipient serve their wine in style with this crystal wine decanter set. 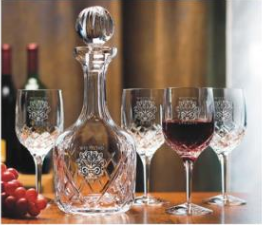 Made from 24% hand-cut crystal, the decanter set can be engraved with artwork and a special message, making it the perfect item this holiday season. 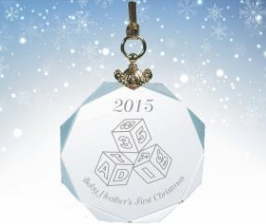 While many of your friends, colleagues and employees may celebrate a diverse range of holidays at this time of year, all will appreciate the elegant, sophisticated design of a beautiful ornament. Whether they are hung on a Christmas tree or from a hook above the fireplace, a well-placed ornament can add class to any space. Our crystal octagon holiday ornament is cut to reflect a maximum amount of light, creating a beautifully illuminating focal point. Personalize it with a special engraving, whether it commemorates another year of business or celebrating a great relationship in the corporate world. As an extra bonus, this ornament is equipped with a beautiful gold hanger, and it is packaged in an impressive black box that leaves a lasting impression on the recipient. 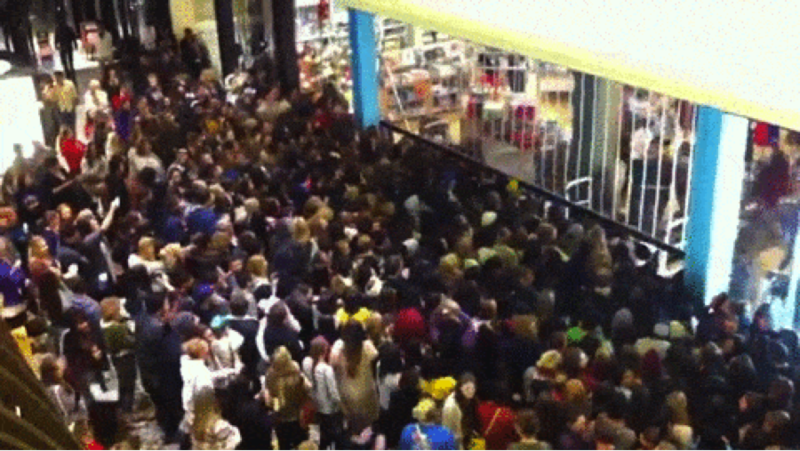 Act Soon Before The Stampede! Get online today and pick out the unique personalized gift that will make you stand out from the crowd!